On 31st of all months with as many days a rally in support of freedom of assembly is held in Moscow’s Triumph Square. 31 December was no exception with a massive police presence and many arrests. Ilya Yashin recounts his own story of decent policemen, falsified evidence and a night in the cells. On 31 December I made a slip in my speech in Moscow’s Triumph Square. Instead of saying "the constitution is more important than eating Salad Olivier" [usually served at New Year, ed. ], I said into the microphone that "The constitution is more important than freedom”. As it turns out, this slip was prophetic: the defence of the Constitution and the Truth cost Boris Nemtsov, Konstantin Kosyakin and me our personal freedom. The regular demonstration in support of freedom of assembly had started quite peacefully. As usual, the police and the Interior Ministry forces had fenced off the square and set up massed cordons. But the crowd was quite big because of the public holiday. There were the usual placards and also quite a few slogans in support of Khodorkovsky, who had been given 14 years the day before. The human rights activists on the podium were Lyudmila Alekseeva and Lev Ponomaryov; the politicians Boris Nemtsov and Vladimir Ryzhkov were also there, as were public figures like Evgenia Chirikova and Katya Gordon. There were quite a few highly-respected people in the crowd too, such as Natalya Fateeva and Sergey Yursky. Just before we got to the underpass our way was barred by a column of OMON "cosmonauts” dressed in camouflage and the cops were pushing up behind us. At the end of the meeting there was a rumour that OMON [Special Purpose Police Unit, ed.] was making arrests in the corner of the square. Nemtsov, Ryklin and I gathered a small group of activists and set off in the direction of Tverskaya St. Just before we got to the underpass our way was barred by a column of OMON "cosmonauts” dressed in camouflage and the cops were pushing up behind us. A crush quickly formed and the police started grabbing people. I was one of the first. You were seized out of the crowd, had your arms twisted up behind your back and you were shoved into a police van. 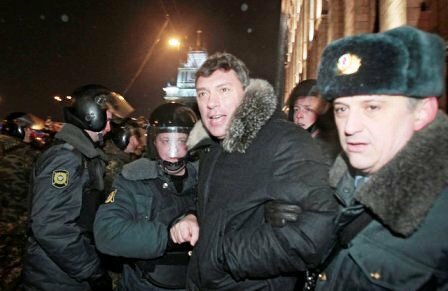 Nemtsov was arrested a bit later, together with several dozen defenders of the Constitution. There were 7 people in our van. Everyone had to empty out their pockets and was meticulously searched. 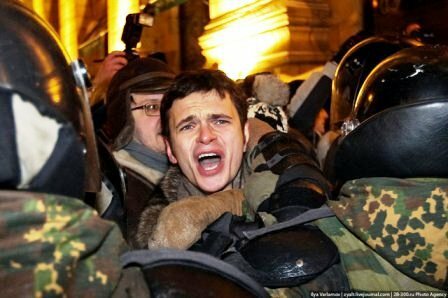 Alexei Svidersky from „Solidarnost” asked the policemen to identify themselves and was immediately beaten up by two thugs in police uniform. An hour later we were eventually delivered to the Basmanny police station. There were 24 people in all at the police station. I knew many of them: activists from Solidarnost, lads from „Left Front” and some National Bolsheviks. Almost all the local policemen on the beat arrived at the station and quickly filled out charge sheets for crossing the road at the wrong place. This article of the Criminal Code merits only an oral warning, but when the charge sheets were completed, we were all taken down to the cells. Half an hour later Dima, the policeman who had done my form, reappeared. "Come with me, Yashin” he said, "you mixed up in the criminal world, or what? 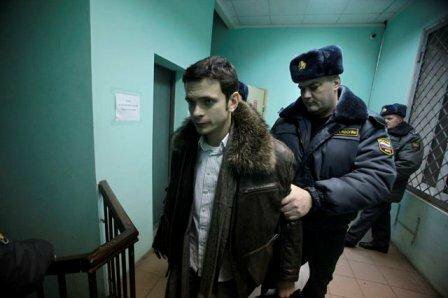 I’ve been told to charge you with resisting arrest.” Dima turned out to be a honest lad. He told me that the bosses had received instructions to lock me up under Article 19.3 for 48 hours before my court appearance. But he promised that he wouldn’t fabricate evidence. He said that if things didn’t stack up, he’d go to his boss and I’d be released. The case against me didn’t stack up from the start. Two sergeants, who had come to the station, told Dima they hadn’t arrested me, they’d only brought me to the station and I’d behaved myself in a civilised way. Dima frowned, took statements from the sergeants about how I was brought to the station and sent them home. Dima came out of the office and sighed. "There’s the good news,” he said "and the bad. The good news is that I’ll get 4 days off for dealing with you. The bad news is that you’ll have to be banged up”. Dima made a wry face. "Hang on” he said. "I’ll explain in a moment. What can I do? We’ve had our orders”. Dima sighed again and clicked his fingers in a gesture showing how the stars would be ripped off his shoulder-pads. 20 minutes later I was in a cell. Dima asked me not to bear him a grudge, made a phone call "I’m on my way, darling” and off he went to celebrate the New Year. It was nearly midnight. The Police respectfully call me a "political” prisoner and ask why we are protesting. The police are quite deferential. They respectfully call me a "political” prisoner and ask why we are protesting. A major came in and brought me some tea. He told me that the Basmanny police station would not be getting its usual New Year quota of drunken revellers and non-Russians. It had been ordained that I should be alone. Just before morning, however, a drunken FSB man was brought in. He’d been caught driving in this state and also managed to break the jaw of some passer-by. Seryoga, as he introduced himself, assured me that he could easily have taken out the three policemen, he "just didn’t”. Half an hour later someone turned up with a document for Seryoga. He was issued with a 500 rouble fine for disorderly behaviour. The FSB man left me his cigarettes as a present. He said I’d be needing them….